John and Christian Bender of Durham Mobile Home Park take a break with me after completing the Cartridge and Bag Filters module. 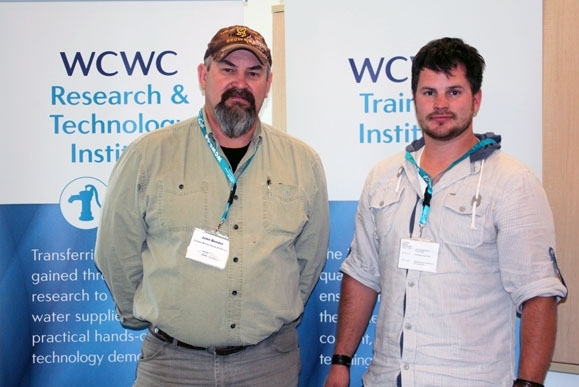 Although we hosted participants from as far as Newfoundland and Ottawa at the WCWC/OWWA Small Systems Hands-on Workshop, quite a few local participants attended as well. 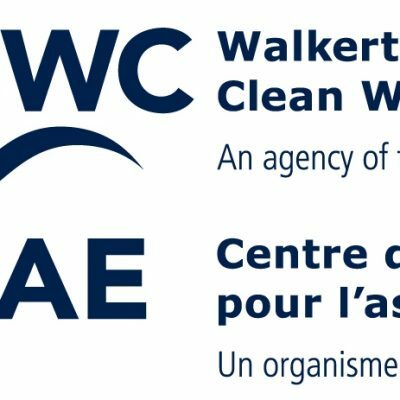 I caught up with a few of the frequent trainees and asked them why they continue to choose the Walkerton Clean Water Centre’s headquarters as their main training centre. You are from the local area and have attended our courses before. Besides the need to take the training, what keeps bringing you back? We are owners of Durham Mobile Home Park and JCB & Sons in Durham, Ontario, which makes us responsible for our own small drinking water system defined under O.Reg. 170/03. Although we’ve had a license for 10 years, we could have used some of the training they are getting now, more than 12 years ago. We now have to know what words like “turbidity” mean and this small systems workshop has provided us with the opportunity to learn more. We pride ourselves on the training we take part in, and tell our customers that we spend a lot of money on training and education. Since we are located only a short driving distance away in Durham, the WCWC training location is perfect. We have been to a lot of WCWC training, including Maintenancefest twice. 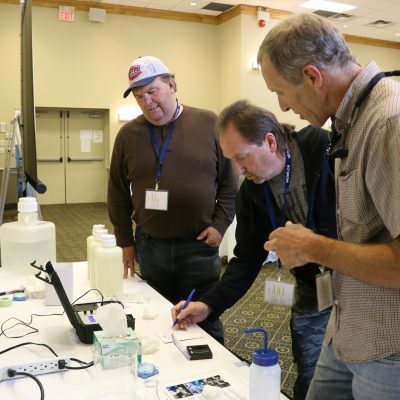 We attended the small drinking water operator course last fall and learned quite a few new things at these events. At this small systems course we found the Cartridge and Bag Filters module to be the best for us. Please tell us your thoughts and comments about the Small Systems Workshop. What will you take away from your day? Christian and I recognize and appreciate the fact that they are making the modules like Maintenancefest, but are keeping it at “our level”. This workshop has been efficient, well organized and well managed. It has provided a good overview of a complex industry. The networking with people from other small parks has been great too. We are realizing that there are people to talk to with similar backgrounds. While yes there are criteria to follow, there is a positive movement towards guidance and uniformity in the industry. Another plus is that the instructors were able to provide trouble shooting advice about the equipment featured. The company representatives here today are a resource for clients like us. We can discover products to meet our needs and put a face to the name. Mike Husk is an operator with the Municipality of Kincardine. 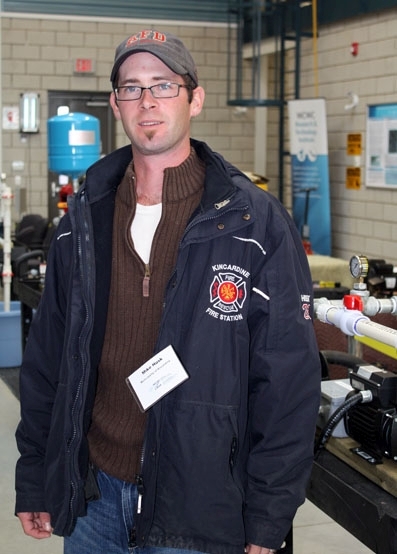 Mike has attended numerous courses at WCWC including Groundwater, Wells & Well Pumps, Water Valve Operation & Maintenance, Preventing Waterborne Illnesses, Ultraviolet Light Treatment of Drinking Water, Treating & Distributing Safe Drinking Water, Centrifugal Pumps and Safe Drinking Water – Lessons from Outbreaks. You are from the local area and have attended our courses before. Besides the need to take the training, what keeps bringing you back? I come to WCWC for training because it is close and convenient to where I live. I also like the hands-on training that WCWC has to offer, in comparison to the mainly Power Point presentations other training facilities offer. I look forward to the 2014-15 course offerings. When courses are separated into beginner, intermediate and advanced, it accommodates the different levels of experience operators have and there is less repetition. Please tell us your thoughts and comments about the Small Systems Workshop. What will you take away from your day? The modules offered at this small systems event are good because they focus on the most basic steps. For example, the majority of the people here today are not licensed operators, so it is a good workshop that can cater to specific needs and small systems. It is also great for anyone looking to learn more about small systems in drinking water. The benefits of the small systems event are similar to that of Maintenancefest. You can pick what modules you need and want to take. The short modules allow you to move around and the breaks in between help keep you interested and the information fresh in your mind.